Dr. Wheeler received her Ph.D. in Molecular Genetics from the Imperial College of Science, Technology and Medicine in London and carried out postdoctoral training at Massachusetts General Hospital. 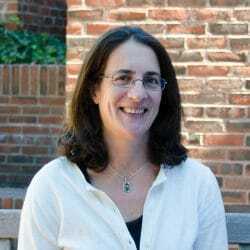 Her research focuses on Huntington’s disease (HD) and other disorders caused by expanded repeats. She receives NIH and foundation support and maintains an active teaching role. She is the recipient of a Claflin Distinguished Scholar Award and HMS Excellence in Teaching Awards. 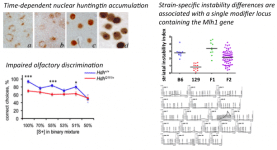 What are the earliest events in HD pathogenesis and the molecular mechanisms underlying them? What are the mechanisms that contribute to the instability of the HD CAG repeat mutation? 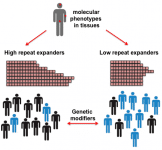 Is somatic repeat expansion a disease modifier in HD patients and across other repeat expansion diseases? Effective disease-modifying therapies for HD will require an understanding of the earliest cellular and molecular changes that occur as a result of expression of the mutant huntingtin gene, as these are most likely to drive, rather than be a response to pathogenesis. To uncover these alterations we are using precise genetic knock-in mouse models of HD that provide a window into early, pre-manifest HD. This forms the foundation for uncovering underlying mechanisms using genetic modifier approaches as well as defining endpoints for pre-clinical testing. The HD CAG repeat is highly unstable both in the germline and in somatic tissues where it progressively lengthens over time. 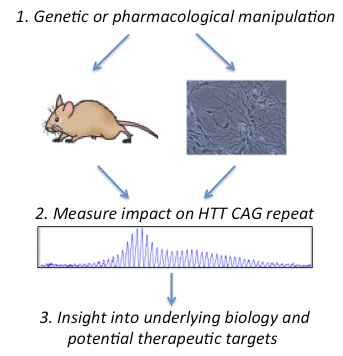 We are using a variety of complementary methodologies to uncover the mechanisms underlying CAG instability, including genetic and pharmacological approaches in HD mice and in human iPSC-based models. 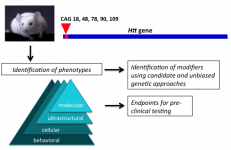 Recent genome-wide association (GWAS) studies in HD patients point to a role for DNA repair genes in processes that determine the age of disease onset. We are testing the hypothesis that DNA repair genes also modify CAG repeat instability in patients and alter the rate of HD pathogenesis by acting at the level of the CAG mutation itself. We are deriving measures of repeat instability in patient tissues that we can use as quantitative molecular phenotypes in genetic association studies. 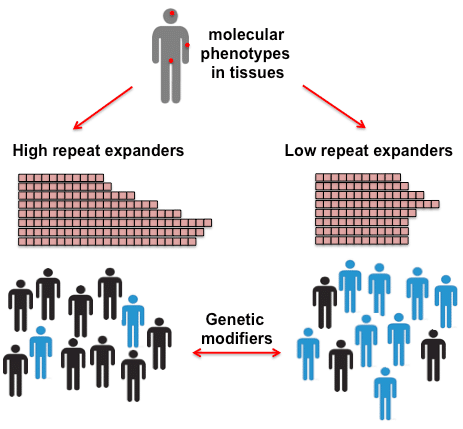 We are also investigating the relationship between instability and pathogenesis in other repeat expansion diseases and the idea that common modifier genes may contribute to disease expression across many disorders. We have uncovered a wide variety of phenotypes in HD knock-in mice that are driven by physiological expression of a single mutant Htt allele. These include tissue-specific somatic CAG expansion, transcriptional dysregulation, nuclear huntingtin accumulation phenotypes, hypoactivity, motor learning and coordination deficits and impaired olfactory discrimination (Wheeler et al., 1999, Hum. Mol. Genet. 8, 115-122; Wheeler et al., 2000, Hum. Mol. Genet. 9, 503-13; Wheeler et al., 2002, Hum. Mol. Genet. 11, 633-40; Holter et al., 2013, PLoS One. 8(11):e80923). To gain insight into underlying mechanisms we performed an unbiased genome-wide genetic screen and uncovered mismatch repair gene Mlh1 as a driver of strain-specific differences in somatic expansion (Pinto et al., 2013, PloS Genetics 9(10):e1003930). Our genetic studies have uncovered mismatch repair genes Msh2, Msh3, Mlh1 and Mlh3 as critical mediators of somatic CAG expansion in HD knock-in mice (Wheeler et al., 2003, Hum Mol Genet. 12, 273-81; Dragileva et al., Neurobiol. Dis. 33, 37-47; Kovalenko et al., 2012, PLoS One 7(9):e44273; Pinto et al., 2013, PloS Genetics 9(10):e1003930). These genes also modify pathogenesis in the mice, indicating that somatic CAG expansion itself contributes to the disease process. To test this hypothesis further in mice we are analyzing phenotypic expression in knock-in mice with interrupted, somatically stable repeat tracts. Further understanding of the factors that contribute to repeat instability will provide insight into the underlying mechanism and the means to specifically intervene in this process. 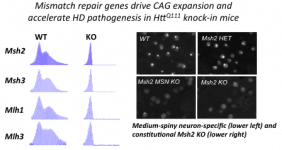 We have analyzed CAG repeat length in single molecules from postmortem cortex samples from HD individuals that exhibited either earlier or later disease onset than that predicted from the length of their inherited CAG repeat (Swami et al., Hum. Mol. Genet. 18, 3039-47). We found: 1) extensive CAG instability in the cortex, with ~10% of alleles expanded by over 10 CAGs; 2) that individuals varied in the extent of somatic CAG instability; 3) that longer expansions were associated with earlier disease onset. These results indicate the presence of individual-specific differences in the propensity for CAG repeat expansion. Uncovering the genetic factors that contribute to these differences, and their relationship to clinical onset will provide insight into underlying mechanisms of repeat instability in humans and novel therapeutic targets.